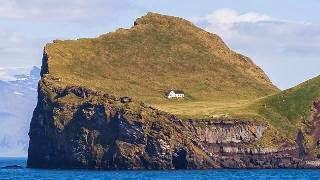 This puffin-hunting lodge, with no electricity or indoor plumbing, was built in 1953 and is now trumpeted as the most isolated house in the world. It is located on the island of Elliðaey, part of the Vestmannaeyjar archipelago south of Iceland. While native pop singer Björk may or may not have considered buying the property, and Iceland may or may not be interested in selling the islands off its coast, the fact is that it was not presented to her as a gift by the government of the country grateful for the attention she has brought it.